I've had feelings that things weren't well at B&N. If these observations are true then there could be one last clearance sale. Not surprising. They've been struggling for a while. It really is only a matter of time given their business model - I'm surprised they are still somewhat relevant for this long. The crazy thing is aren’t small indie book stores on the rise? I think they just had way to many skus and overhead. Also... so much junk. Gift boxes for the juggler in your life, a book to teach you to play the ukulele WITH the Uke included... etc. Low cost, high return items are there to pad the line while their low margin items get squeezed even tighter. Remember, thoughtless gifts / novelty gifts will always sell. I almost exclusively buy deep discount items there- such as when they have their twice yearly Criterion Collection 50% off sale. I’ll be sad if those go, but my buying habits at B&N certainly don’t do much to keep their lights on. I taught myself to juggle and to play the harmonica using thoughtless gifts purchased at B&N. i have one of the new store layouts in my area and it's got little to any games and has a large bar/coffee section, more of a cafe with large book store. It's a very interesting change. I'm curious if that model works better for them and that's what they're moving to? Have you seen my candy cane. I seem to have misplaced it. Once upon a time I spent thousands a year at B&N but after moving, we've found only the absolute worst customer service. That's pretty bad considering once time years ago, an employee in Anchorage Alaska threatened us when we were seen in the LGBTQ section. They even accused my child of stealing a book that another employee gave them as part of a promo for achieving goals of reading "x" number of books. After that (employee was dicsiplined as was overheard by other customers and employees). I feel the local store where I live to be even worse in overall customer satisfaction. This was a top down management problem they've faced forever, and they'll not last any longer by tossing the dedicated employees. However, it's silly they thought they mattered when they could see customers often don't. With amazon and a rise of online and local used bookstores I almost never go to bn anymore. Even with their membership program and discount coupons they still tend to be more pricey than the other places. Drive to the store, weave your way past people who confuse book store with library, standing in the aisles spending literally hours reading books they have no intention of buying. Dodge others and their drinks leaving the open cafe area not watching where they're going. Decipher which section the book you're looking for may be in, then if they buck the odds and have it at all it may be dog-eared and cover creased from someone else having already read it. Walk to the register and stand in line as only one cashier awaits to make you pay full retail for your possibly used condition prize. God help you if you make the mistake of asking an employee for help locating something. If I was interesting in spending an afternoon at a crowded, noisy coffee shop that stocked mostly recent mass market books on the side, I'd be all over Barnes & Noble. Unfortunately for that business model a very broad selection and a quiet environment are what I look for when I go book buying. Little doubt online discounters are a factor for Barnes & Noble's decline. But their core business model became irrelevant when their primary products in stock status became unreliable and required more time from their customers to obtain when they were available. Simply put I didn't give up on Barnes & Noble because of price, I gave up on them because they were a flat out waste of my time for making most of my book purchases. If it weren't for their hardback classic book editions (which they scaled back new releases for a long while ago), I'd never go into their stores. The demise of the physical book store is something I'll always lament. The demise of Barnes & Noble and what they currently are, not so much. I am rather surprised they survived this long. I figure at least part of their problems can be traced to the Nook, which couldn't really compete with other e-readers, competes with their own physical book sales, and has a terrible, terrible name. I've got a gift card with 6 or 7 bucks left over from Christmas. Looks like I should head over to my local store soon. Yes they opened a new one out my way and it had the big Coffee shop, no games and a much smaller selection of book than the normal store. Almost like they are taking a more Amazon storefront style where they have fewer books. Going to make it hard "not" to use amazon to buy books soon as I almost never find anything more than a few years old at B&N these days. My experiences with them have been positive.... clean stores with nice layouts and friendly employees that helped whenever I had a problem. I want all businesses to do well, but I also believe that it's up there o the business to do it. Barnes and Nobles' business model has always been book-browsing. If you know what book you want, you order it through Amazon. You'd go to Barnes and Nobles to look around and then you'd find something interesting to buy. There's some kind of 30% off coupon out atm. Track that down before you go! Who did not see this coming a mile away? In today's age of speed, convenience, and low prices online, how can you not adjust to keep pace. They berried their heads in the sand and just hopped we would keep going to their stores because they are there. I went in around Xmas with a store add from online to buy the item they had listed. They told me no they could not sell it to me at that price as it was online only. The kicker was it had free shipping attached to it. So are you telling me it is cheaper for the to UPS me a book than let me pay for it at the store? Come on I am not buying it. Are the stores clean? Yes. Are the people helpful? Yes? do they care about my budget and building a loyal costume base? NO! In the end there is just not space for a company that does not care in this day and age. A relic of a bygone era that is a hang out for mall-rats. I guess our future is that everything will be online (not only purchase of new books, but, ebooks, streaming movies, streaming music). I'm kind of sad that my young daughter will never experience browsing for books in a physical store, or browsing for movies in a video rental store, or the joy of reading through the liner notes and art of a new CD purchase. My one hope is that used bookstores will continue to thrive. At least in cities and towns where there is enough market to sustain them, like college towns and larger cities. Although, I wouldn't be surprised if Amazon lobbied to make such stores illegal, once they've achieved monopoly of new book sales. Their lobbying power will only grow (maybe to NRA-levels and beyond?). i have one of the new store layouts in my area and it's got little to any games and has a large bar/coffee section, more of a cafe with large book store. They opened a high-end restaurant-bookseller concept store here too, last year. They're calling it "retail-tainment". They've apparently been testing this concept at six stores around the country. I have no idea if it's doing well or not, but this one is still here. Take your daughter to the library. They're way more interesting than bookstores and will likely have a larger selection of books anyways. Absolutely, I completely agree!... as libraries are now. I fear for libraries too, though. 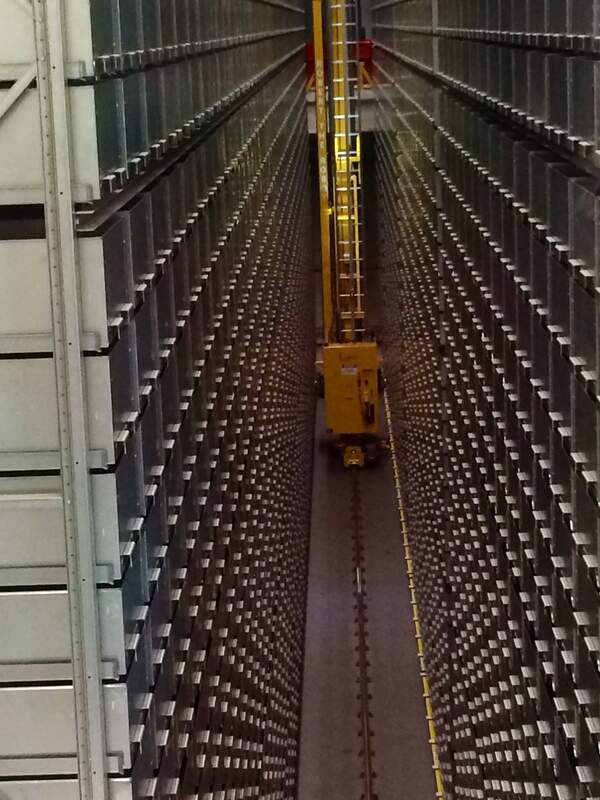 My local university has converted one of their libraries to a BookBot, which warehouses all the books and has a robot fetch you the one you ask for. See image below and Google BookBot for all the fun details. When asked about the experience of browsing physical shelves of books, one of the implementors said that such an experience could be done just as effectively using a digital "bookshelf" interface, where you see digital representations of the book covers in the order that they would be on the shelf. And, it's only a matter of time before libraries decide it's just a lot cheaper to have everything digital, no need for physical books. Look at the planned Obama Presidential Library - it'll be the first presidential library to have digital-only presidential materials. No hard copies of anything will be on-site (even stored on-site), at least from what I've been able to gather.